Food Blogga: A Fast, Fresh, and Delicious Dinner in Under 30 Minutes. A Fast, Fresh, and Delicious Dinner in Under 30 Minutes. Weeknight meals can be a challenge. That's why there are so many cookbooks and cooking magazines offering tips and solutions on how transform those hectic weeknight meals into "meals in minutes." Whether it's a promise of a "10 minute meal" or a list of "fast and easy suppers," there's no shortage of help out there. So today I'm offering my own fast and fresh weeknight meal. 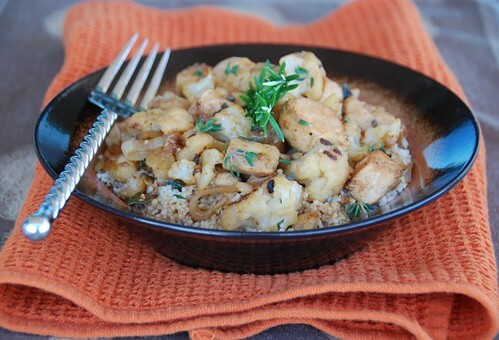 This Herbed Chicken and Cauliflower is easy, healthy, and delicious. You can make this dish and be sitting down to eat it within 30 minutes. Really. The savory sauce made from white wine, vegetable broth, mixed herbs, and cornstarch clings deliciously to the sauteed chicken and cauliflower. It's a well balanced meal that is high in lean protein, complex carbohydrates, vitamins C and K, and fiber. So there you have it. Fast, fresh, healthy, and delicious, all in less than 30 minutes. In a large skillet over medium-high heat, heat olive oil; add shallots and saute until translucent , about 3 minutes. Add the chicken; cook until browned all over yet still tender, about 8-10 minutes. Meanwhile cut cauliflower into florets. Place in a large pot of boiling water for 3 minutes; drain. Once chicken is browned, add the cauliflower, cooking until browned in spots. Add white wine (the alcohol will burn off, but the chicken and cauliflower will be infused with its flavor). Once the alcohol reduces, add the vegetable broth with cornstarch. Reduce heat to medium-low; cook for 10-12 minutes, or until the sauce thickens. Turn off heat; stir in fresh herbs, and season to taste with salt and freshly ground black pepper. Meanwhile, place couscous and water in a microwavable bowl. Microwave on high for 1 minute. Let rest for 5 minutes. Fluff with a fork before serving. Divide couscous among 4 plates. Add 1/4 of the chicken and cauliflower to each plate. Garnish with additional fresh herbs, if desired, and serve immediately. So lush looking with that touch of rosemary. It looks like you actually could do this in 30 minutes and have a healthy wonderful dinner. Drives me nutty when cookbooks tell me it'll take 20 minutes and it takes an hour and 20 minutes. I love this! I like these fast week night dinners, when I come home from work I'm usually starving and if it takes too long to cook I end up snacking on cheese and crackers, or something else that's not necessary. A great idea! 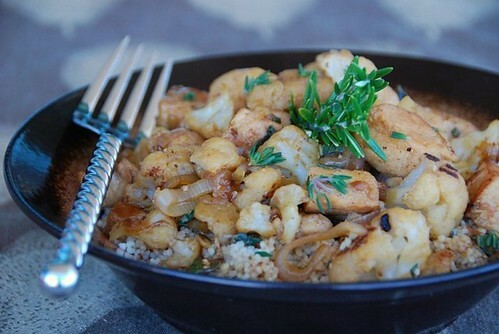 I love chicken and cauliflower! That healthy meal is not only fast to make, but also delicious! Chicken, cauliflower, white wine?! Yes, yes, yes!! All part of a dish that comes together in under 30?! Sign me up. I'm totally sold. This recipe sounds and looks absolutely delicious! Cauliflower is one of my favourite vegetables, I don't have it often enough. This dish is a great idea, not just for weeknights either - as I find I have little time at the weekends too! What a great option for when you don't feel like/don't have the time to be cooking for hours. I don't eat cauliflower raw, but love it cooked. Sounds delish! I travel one-hour each way to work every day, so anytime I can prepare a meal in 30 minutes, that's more quality time for me! Having a quality dinner certainly helps, too! Absolutely making this - sounds wonderful and I can't wait to try it with cauliflower. A new veggie to add to our mix! Looks very good, I'll be trying this one!I love fast meals. maris-Oh, I'm so happy to hear that it'll help. rosa-They do pair well together, don't they? elyse-Yay! You made my day! nic-It's an underappreciated veg, isn't it? cwannabe-I only like it cooked as well. bill-I would definitely sub tofu, though I personally wouldn't prefer the fish. Pork would work well too. tw-I agree. Then you more fun time! Always looking for these kinda recipes. This is what I do most of the weekdays. We love cauliflower & this is a lovely combi.. & easily interchangeable with different ingredients. Lovely Susan. My evening meals are always quick ones or leftovers from big weekend cooking. This recipe looks delicious and quite versatile too. Thanks for posting it! What a great combination of flavors, Susan, and so quick and easy--always a plus on weeknights. And thanks for the tip on microwaving couscous. Couscous rules for quick meals! On the topic of cornstarch--have you ever subbed kuzu? Cauliflower is totally underused, but it's so good. Thanks for reminding us! A delicious healthy meal and also quick to make! Looks great. So should I time myself if I make this for proof? ;-) Interesting way to make couscous. That really cuts down on cleanup time because you can cook and serve in one plate instead of having to wash an extra pot. The dish sounds amazing. I love cauliflower but rarely cook it as the rest of the family don't like it. just letting you know i linked to your curried red lentil soup today on anm--have a great weekend! I usually see your blog and it's very good with really nice recipes. I'm from Portugal and i create a blog about portuguese food.I hope you pass there. This sounds delicious and quick! Perfect for a weeknight, especially these days when I come home from work, make dinner and then start my freelance work! I love quick and easy dinners during weekdays! This sounds like a perfect one to me! Yum that dish looks terrific, Now if I can just trick my husband into eating cauliflower!! susan, don't go all rachael ray on us now... you're too darn good! kidding! but we kind of do need more of these good go-to meals during the week. healthy, inexpensive and TASTY. yum. why do i not eat more cauliflower? I love that this is quick, easy and healthly!